A Texas owner of a new Jeep Wrangler had the trail-rated fun end with a busted engine after fording about ten inches of water. Now enthusiasts are debating whether the driver was too tough or the Jeep wasn't tough enough. The owner in question, who posts as JKTester on JeepForum, still had dealer plates on the 2011 Jeep Wrangler Rubicon when he took to the off-road trails two weekends ago. On a final run, the Jeep plunged into some muddy water that doesn't appear that deep, but its engine died before reaching dry ground. After what JKTester said was hydrolock, or water in the engine, the Jeep was towed back to the dealer, which has declined the warranty claim so far. You will clearly see that I avoid romping through an area with large ruts, I am clearly not slamming on the gas and that the water really was not that deep. After you see the video I will be happy to hear the few that are up in arms that a Wrangler should not be used for this purpose tell me they would not attempt the same thing. At that point they should delete their forum accounts because they have soccer-mom-mobiles...not Jeeps. No offense meant to anyone expect those that are too afraid to have a little fun in their toy. If you want a vehicle get a hybrid...I have a toy that also gets me to work. 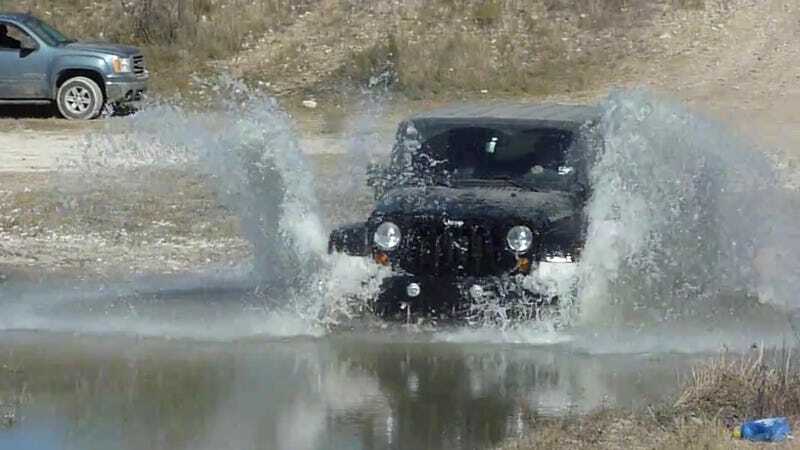 Most Jeep advertising features the Wrangler and other models splashing through water and mud at speed as part of their "trail rated" marketing. But while Jeep once said the Wranger could safely ford 30 inches of water at slow speed, it now warns: "Do not attempt water fording unless depth is known to be less than 19 inches." I can not believe that your jeep died doing that. It didn't even look close to being too fast to me. I've seen way worse entries, in way deeper water. I agree, the jeep commercials show a bigger splash. It's actually very clear that pass was enough to hydrolock the engine. Do you see the constant stream or roostertail of water to the passenger side of the Jeep going as high as the roofline? Does water only go to the outside of the fenderwell when a tire hits it at speed? No, it spreads in an equal V pattern. Now look again closely at how much water is being thrown outside of the fenderwell. It's pretty safe to assume the same amount of water is being thrown to the inside of the tires directly on the engine, intake, and hood. The hood serves as a good water deflector to redirect the water directly into the air intake horn.